ID: 447 ~ Source: Image courtesy of Andrew Feight, Ph.D., from the Scioto Historical Series, private collection, Friendship, Ohio. In 1994, the residents of Portsmouth commissioned Robert Dafford to design and paint a mural memorializing what many consider the greatest moment in Portsmouth sports history. 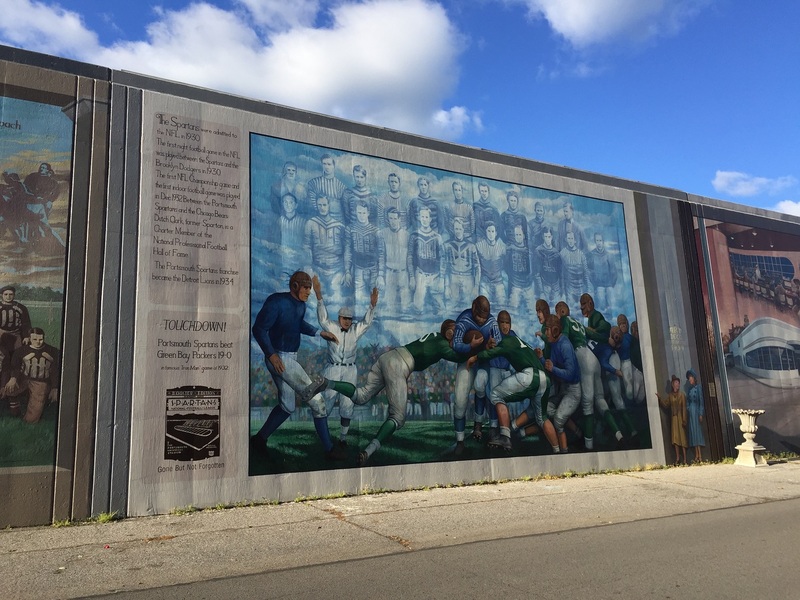 The mural depicts the leather-helmeted, Glenn Presnell -- the Spartans’ star halfback -- scoring a touchdown in front of a cheering home field crowd, which has jumped to its feet in celebration. Scheduled for December 4th in Portsmouth Universal Stadium, the game pitted the Green Bay Packers (reigning NFL champions) against the Portsmouth Spartans. Before a crowd of 13,000 or more fans, the Spartan starting line-up played the full 60-minutes, without substitutions, and defeated the Packers 19-to-0. The victory knocked the Packers off their throne and paved the way for the Spartans and Chicago Bears to play the first ever post-season NFL Championship game, later that same December.